A new version of the most powerful database, object, module, and text comparison product for Microsoft Access 2010 is now available. In conjunction with the new release of Total Access Detective 2016 and 2013, we've created version 14.5 for Access 2010. If you need to know exactly what changed between any two MS Access objects or databases, Total Access Detective is for you. If you are upgrading from Access 2007 or earlier, these were the enhancements that were added in the original release of Total Access Detective 2010, version 14.0. Total Access Detective includes add-ins for the 32 and 64 bit versions of Microsoft Access 2010. It supports any operating system those versions support including Windows 10 and 8. The setup program automatically detects which version of Access is installed and installs the appropriate version. This means you can use Total Access Detective 2010 with Microsoft Access 2010 to compare databases created by older versions of MS Access. 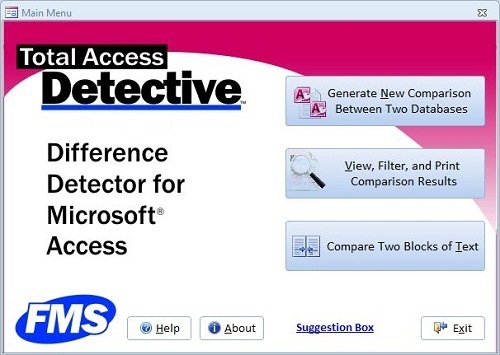 Because Microsoft Access 2013 discontinued support for ADPs, Total Access Detective 2010 is the last Access version that finds differences between ADPs. Total Access Detective compares module code for differences. 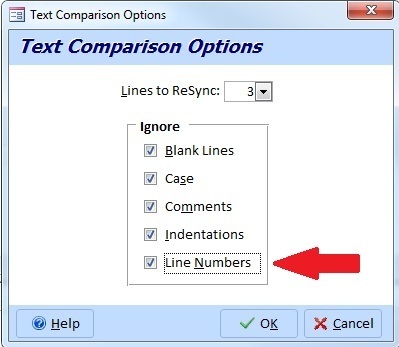 Module code may include line numbers to help with error handling to pinpoint exactly which line of code is crashing. The [Select All] and [Cancel All] buttons work on the filtered list. After comparing two databases, when viewing the Object Differences, the filter for the object names and properties also has the Name filter. In addition to viewing the data in the tab, corresponding export and reports are available. A new user manual and help file are provided. Due to the differences within each version of Microsoft Access, Total Access Detective is specific to each version of Access. Total Access Detective is licensed on a per user basis. Each user who runs the program must have a license. "Total Access Detective is well worth every penny, it will quickly pay for itself through savings in time and effort."